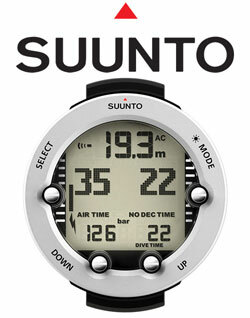 The Vyper Novo dive computer, by Suunto, is the next generation of wireless air integration and computer technology (Air Integration Optional). It allows you to monitor your tank pressure and air consumption from your wrist or your console; you choose the location. Its 3-D compass will quickly become your new best friend; its ability to give a true reading, even at a 45° degree angle, will make keeping your heading easier than ever if you use enriched air, you can program the Vyper Novo for 3 gas mixtures in 1% increments for nitrox mixtures (21-99% oxygen).